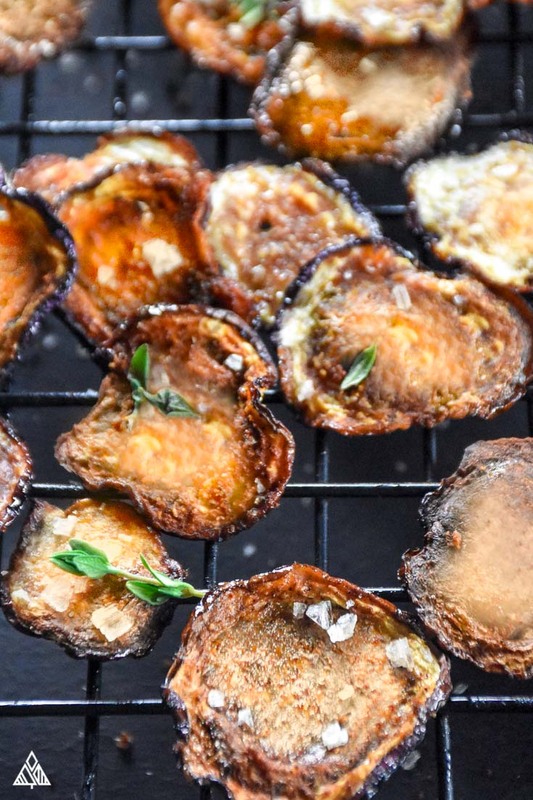 Baked Eggplant Chips — Your New FAVORITE Veggie Chip! I know what you’re thinking—and yes! It’s totally possible to make eggplant chips low carb, crispy, crunchy, salty, smoky, hearty, and every bit as pleasing as its boring been-there-done-that potato counterpart. These chips might even make an eggplant fan out of your picky-eating friends and family, can you imagine? You can make these effortless eggplant chips vegan, ketogenic, paleo, low carb, and terrific-tasting! How, you may ask? Well read on, my friend! My favorite part about these chips (besides the crisp and the beautiful flavors, of course) is that they satisfy every single dietary regulation I can think of. Low carb? Check. Paleo? Check. Vegan? Check. According to many keto websites, eggplant is a preferred vegetable—1 cup cubed contains only 4.82 grams of carbs, 2.5 grams of which are fiber. Which is a total score! Some of the most delicious veggie chips aren’t made with keto-approved vegetables—veggies you wouldn’t expect like beet chips and parsnip chips. Paleo is much easier to accommodate in the healthy chips world—from cassava chips to plantain chips, enjoy! 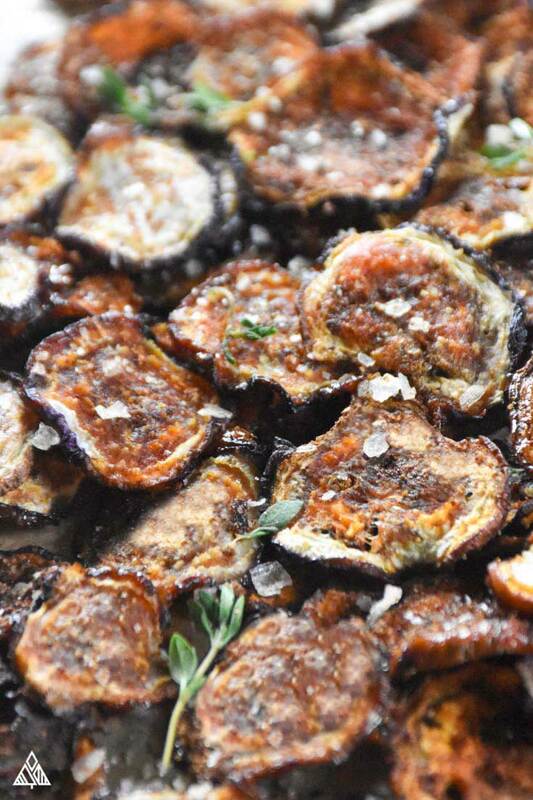 For this recipe, using honey (instead of erythritol) will produce eggplant chips paleo, and are sure to please any caveman that crosses their path! This process takes a careful hand, a little know-how, and the right kitchen tool: a mandolin slicer. It’s almost impossible to cut eggplant into sufficiently thin and even slices with a sharp knife, which will leave your chips soggy in places and burnt around the outsides—a total chip-no-no. 1. The quick route which will make the chips less crisps but save you 30 minutes. 2. The long route, which will result in crisper, less bitter chips. Option number one is easy. Place your slices on a baking sheet lined with parchment paper. Then using a brush, coat the slices with the oil and seasoning comb, and pop in the oven! In no time you’ll be snacking on deliciously flavorful low carb chips. You must “sweat” the flesh of vegetable—which can easily be done by sprinkling a generous amount of salt on a freshly cut edge, helping to pull the veggie’s water to the surface. Then you’ll rinse off the salt and pat out as much of the moisture as you can. Now, how long do you allow the low carb vegetable to sweat? Traditionally, this process is done for 30 minutes on each side—but most recipes require much thicker slices than these chips—so I went with: 15 minutes on each side. It gave my chips the perfect amount of crisp-y-ness! Yes, you can dehydrate eggplant, however, if you’re trying to achieve a crispy chip, this isn’t the way to do it. 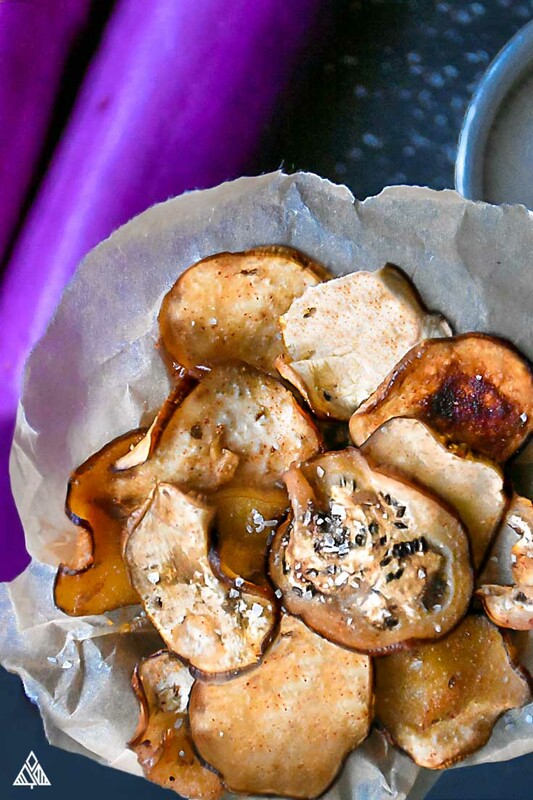 I was very disappointed in the chewy eggplant chips my dehydrator produced—but if that’s what you’re looking for, then the dehydrator may be your tool! Eggplant chips airfryer recipes and eggplant chips dehydrator recipes are temptingly quick and bouncing bountifully around the world-wide web—but I prefer the tried-and-true oven bake that allows the delicious added flavors like paprika, garlic powder, chili, and honey to marinate fully with your fried eggplant chips. But don’t be afraid to try it out! These chips are so easy to make, you’ll have nothing at all to lose. I can never compile too many easy recipes for low carb snacks featuring delicious, fresh vegetables, and this one has quickly risen to the top of my favorite go-to low carb snacks list. 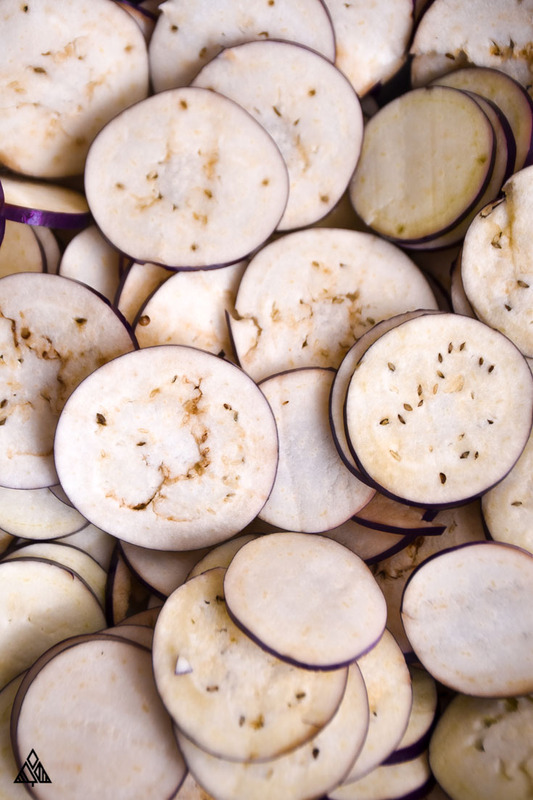 Eggplant is one of the heartiest low carb vegetables to work with, and the consistency is delightfully similar to a high carb/low fiber potato when sliced thinly enough and cooked correctly. I’m currently testing our every kind of veggie chip recipe imaginable, so keep checking back as my recipe box for chips continue to increase! Low carb vegetarian recipes seem to be few and far between, and this crispy eggplant is one of the very best vegetarian low carb appetizers and snacks around. Grab your mandolin slicer, pull out a baking sheet, and preheat your oven, and in no time at all you’ll be enjoying your new favorite homemade veggie chip. Without further ado, allow me to introduce my tried-and-true low carb Chinese eggplant chips! 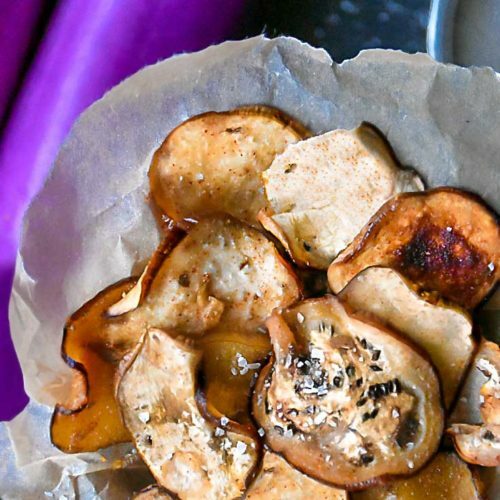 These baked eggplant chips are low carb, crispy, crunchy, salty, smoky, hearty, and every bit as delicious as its boring been-there-done-that potato chip counterpart! 2 Chinese Eggplants 3" thick. *see notes below! Slice the eggplant using a mandolin, or as thinly and evenly as possible using a sharp knife - slices should be around 1/8" thick — Skip to step 8 if you want to save some time, and don't mind your chips being a little less crisp. Spread eggplant slices in a single layer on paper towels. Rinse the eggplant and pat dry with towels. Place as a single layer on a baking sheet lined with parchment paper. Bake until the edges are slightly crispy, about 16-20 minutes, or when the chips are nice and crispy. Keep in mind, the chips may crisp up a little more as they cool. Let the chips sit for a few minutes. If they still seem too soft, place them back in the oven and bake for 2 minutes at a time, until they’re cooked to your liking. * Eggplant notes: You want an eggplant narrow enough to fit on the surface of the mandolin, but not so narrow that you get really small chips! Keep in mind, the chips will shrink as the water is released when we bake them. If your eggplant is smaller than 3", consider cutting it at an angle to get 3" slices. I might try the short version using an elevated cooling rack to see if I can get the air-fry effect. I love eggplant, and I would never have thought to make chips. Thanks! Hi Jennifer! Let me know how that turns out 🙂 I LOVE eggplant as well, and honestly really loved the chips even when they were less crisp— all about that seasoning right?! So you asked that we not share on FB?